Toybank's first Card Making Workshop! We kick-started our events in 2011 with an amazing event in Mumbai. Toybankers all set with drawing papers, Hari Puttar colors and painting kits and ofcourse toys :), walked into Dreamz home on this Tuesday afternoon. For the very first time Toybank was conducting a card making workshop for the children at Dreamz Home. Dreamz Home is a project managed by the Social Development Centre. 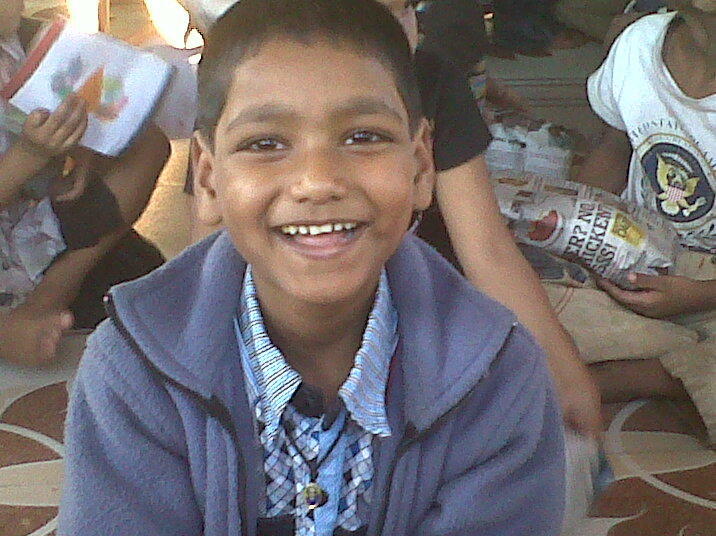 It is a rehabilitation and recreational home for street children and child beggars.
" ‘Toybank’ was formally launched on August 15th, 2004 to conceptualize the vision of Shweta Chari, an Electronics Engineer of a world where all children have a happy and healthy childhood. 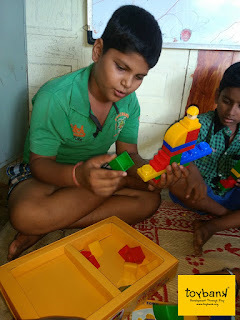 To bridge the gap between children from different backgrounds various activities are undertaken such as dance, sports, painting, etc through creative play/group events/community events. 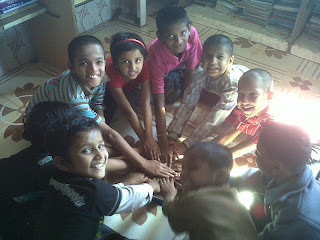 One such group event was held on 18th January, 2011. The children attending this event were between 4 to 15 years of age group. A total of 10 volunteers along with Toybank Mumbai coordinator Farnaza, Toybank Founder Shweta Chari and a Toybank supporter Nathan Hugh Coll (who has come all the way from UK to run the Marathon for Toybank!) interacted with the children. The team conducted a card-making event where in the children were assisted in making greeting cards for one another after being split into six groups. The entire stationary including paints, pencils, erasers, colours etc. were provided to the children. 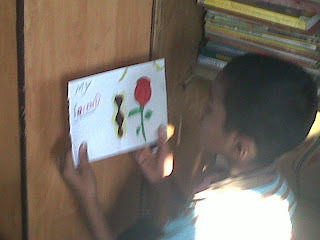 Everyone present at the event was surprised to see the beautiful cards made by the children. Some of the cards were made very artistically. The children were asked to present the cards to the ones they had made it for. Few were lucky to have received more than two cards. This was followed by distribution of toys to the children. The event proved to be an immensely satisfying experience for the volunteers as well as succeeded in spreading joy among the lesser privileged children. It was great interacting with the children whose enthusiasm and vibrancy infused a great deal of satisfaction in everyone’s hearts." 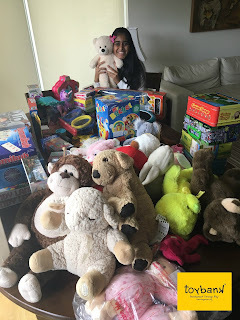 "I recently had a very good opportunity of being a part of Toybank Distribution and I must say that the very feeling of giving a child a toy, of bringing a smile on those innocent faces is just simply beautiful! Being at Toybank has actually made me realise that its not always about money. There is something way bigger than that and that is LOVE! Somewhere I had read that “Time we spent enjoying is not wasted time” It is only here that I understood the meaning of that. I am really glad to be a part of Toybank. The feeling of gifting is something that can only be experienced and not described and I am grateful to Toybank for giving me such a pricless experience. I look forward to various such events. Below are a few pictures I clicked during the Toybank distribution event just to capture some beautiful memories :)"
Catch all the fun from the event here! It's time to run for Toybank!